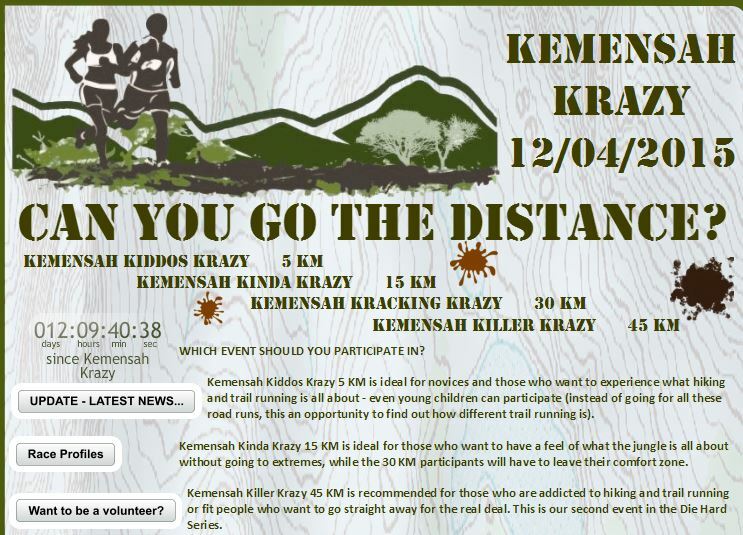 A few months ago Aric asked me if I was interested to join him and a few of his friends on a hike, called Kemensah Krazy. The whole event was organised very well. Free shuttle buses took us from the car park to the start. 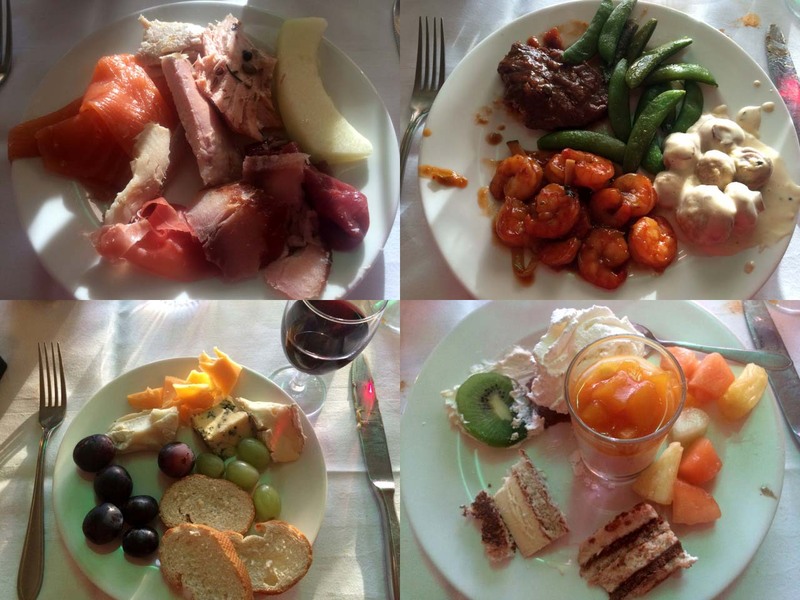 There breakfast was provided and you could leave a bag with a fresh set of clothes at a counter. For our hike there were six checkpoints, with free water and fruits. It was a tough hike, much more strenuous that I had expected. There were a few moments that I thought about giving up. Actually there were quite a few participants who did, halfway. 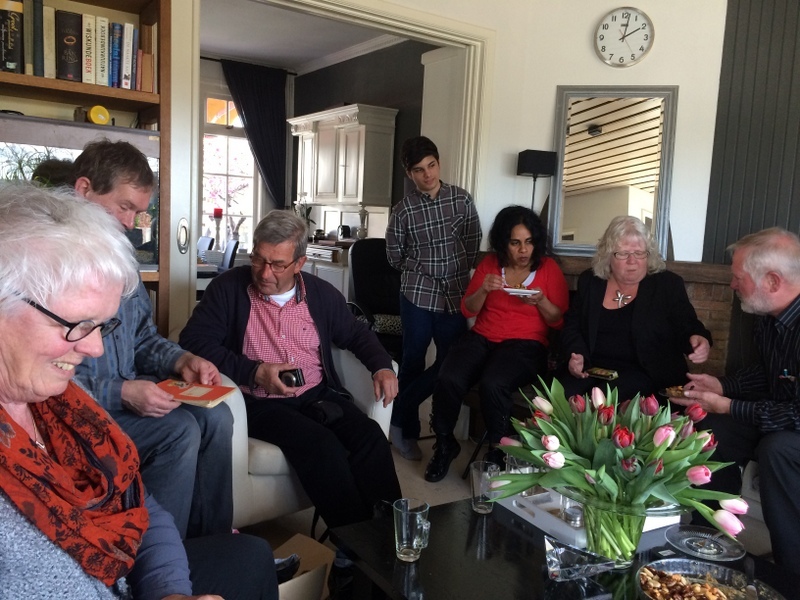 And almost everybody was huffing and puffing. I may have been the oldest participant and one Indian couple asked about my age. 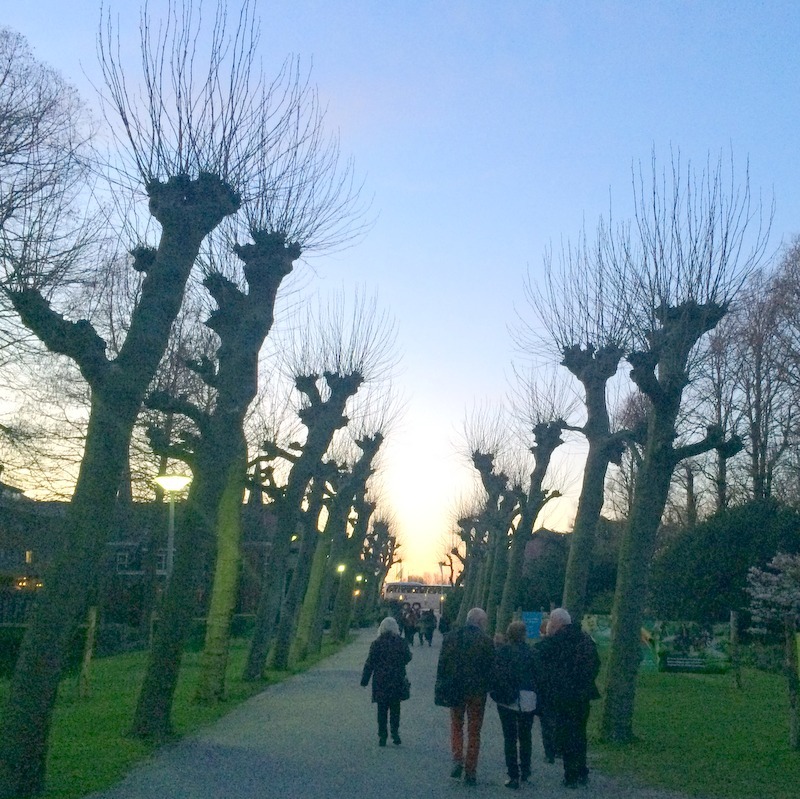 When I said I was almost 71, they replied: Wow, we are half your age. That you can do it, gives us strength to continue. Really nice to hear. The last (very steep!) part of the hike could be skipped without missing a checkpoint. Aric was waiting for me around there, to tell me that…:-) Sweet. But I decided to struggle on. And I made it !! 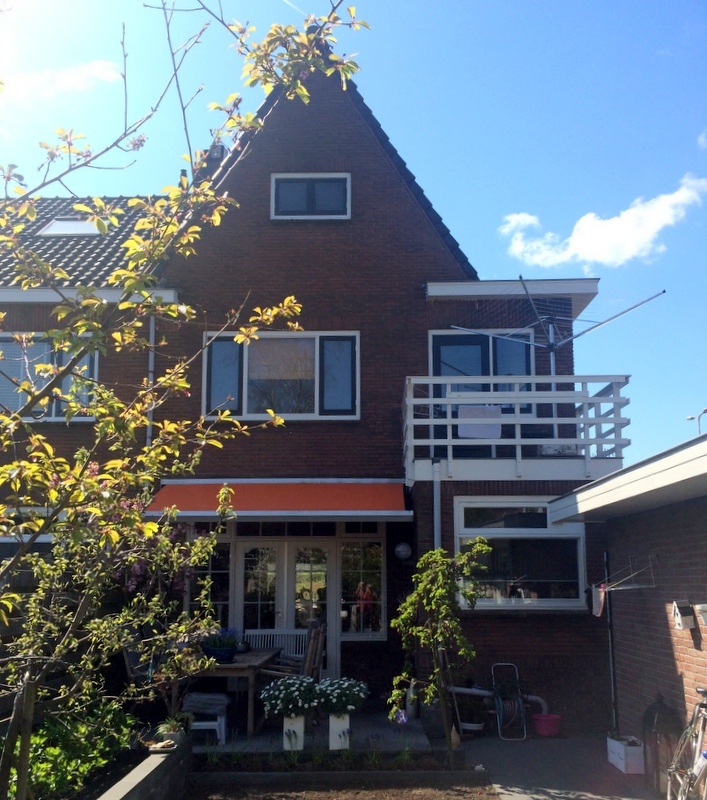 When I shared the finish picture with my siblings in Holland, my youngest brother commented : “Everybody else went home already?” LOL. But his next comment was that he complimented me…:-). 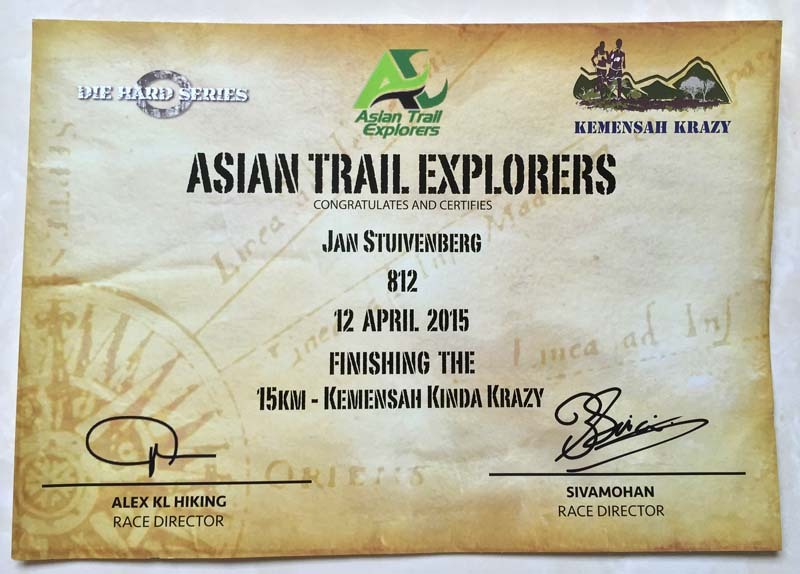 Actually it was true that I was one of the last finishers…:-) It took me more than 6 hours to hike this 15 km. Here is the official result. 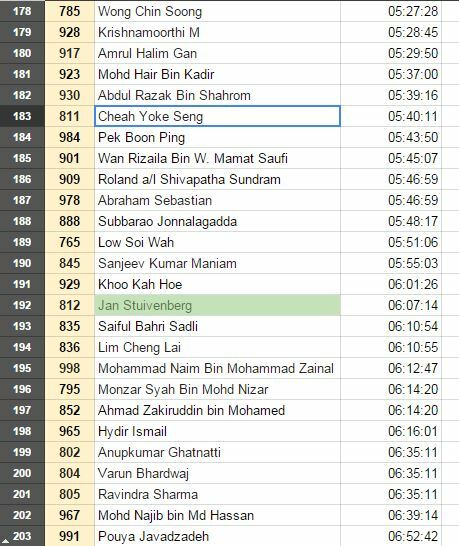 A few participants finished after me. 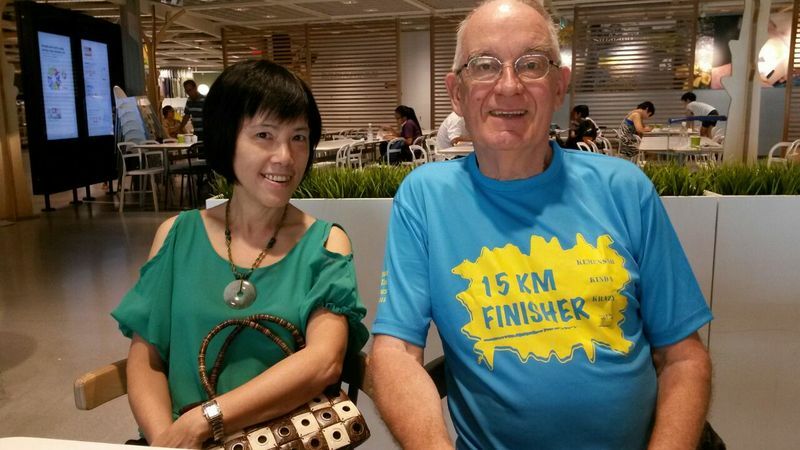 Aric (Cheah Yoke Seng) finished late too , but that was because he had been waiting for me! Later he told me that he and his two friends also had moments where they considered giving up! 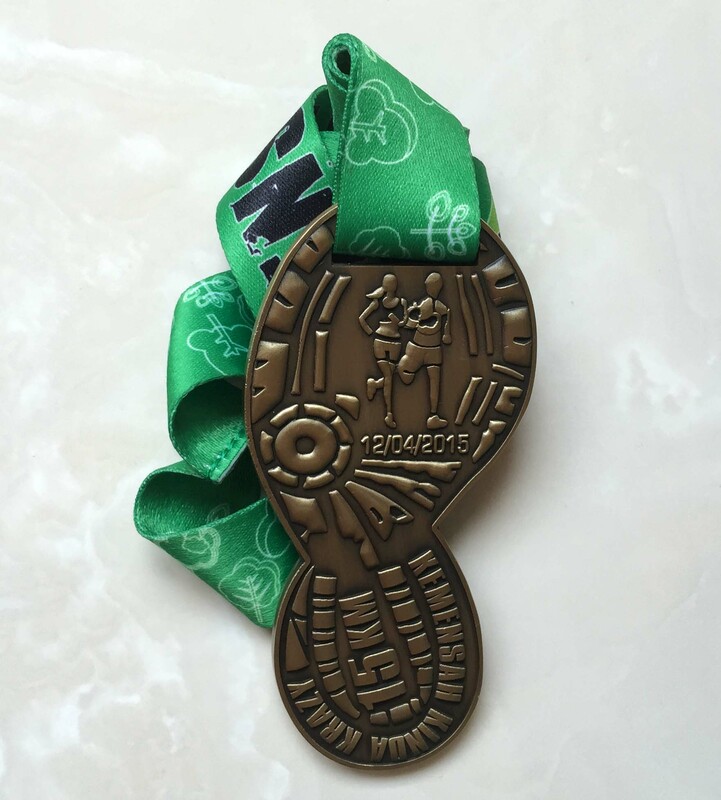 Here are my certificate and my medal. 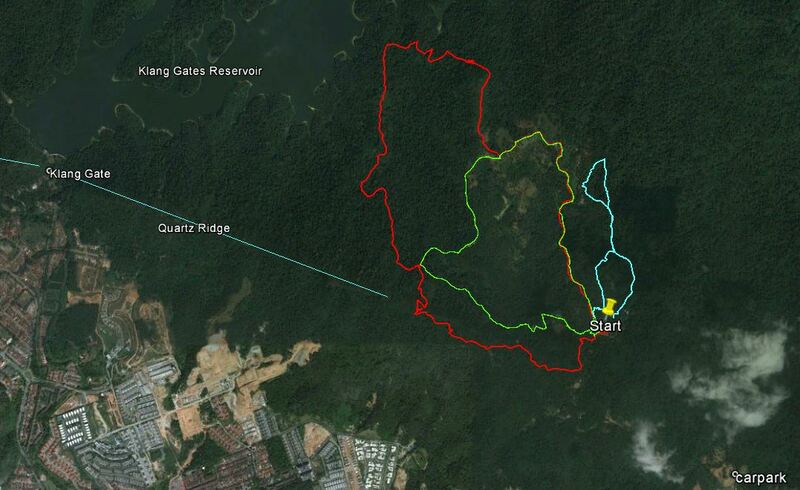 In my last journal I wrote that I had made a long hike in Bukit Kiara with a group of hikers. I joined their Whatsapp group and they know about my interest in waterfalls. 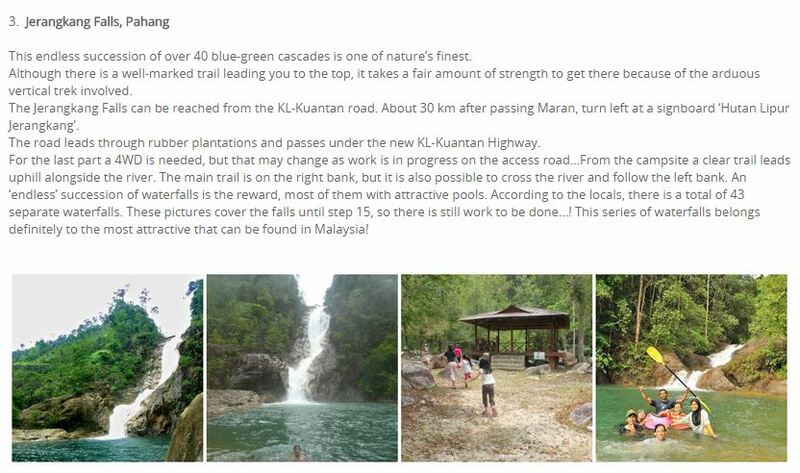 Last week a message was posted in this Whatsapp group with a link to Paradise Malaysia Waterfalls . Of course I was interested and I opened the link. Surprise! Hey, it is about me! Here is the opening page (click to enlarge). 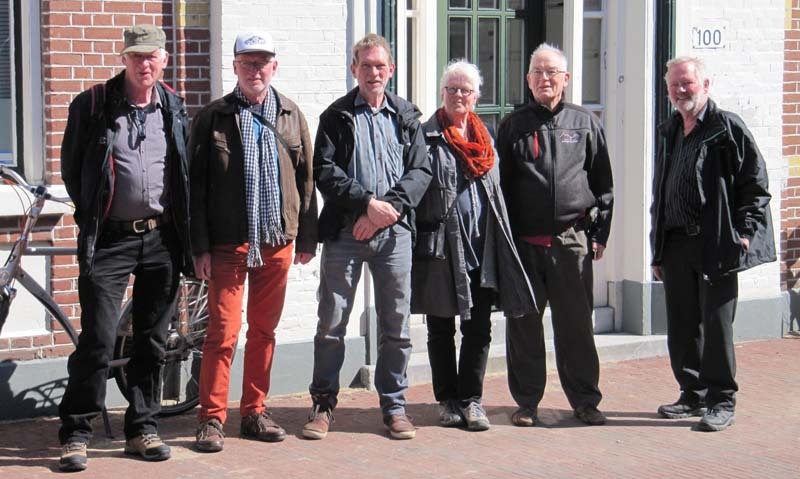 The website belongs to the Big Blue Taxi Services and this article has been added to the site in August last year, by ‘bigblue’. But I have never had any contact with this company, I have never used a Blue Taxi in KL and when I read this: Avoid Blue taxis in KL at ALL cost! , I never will in future, LOL. So, how is it possible that I appear on this site? 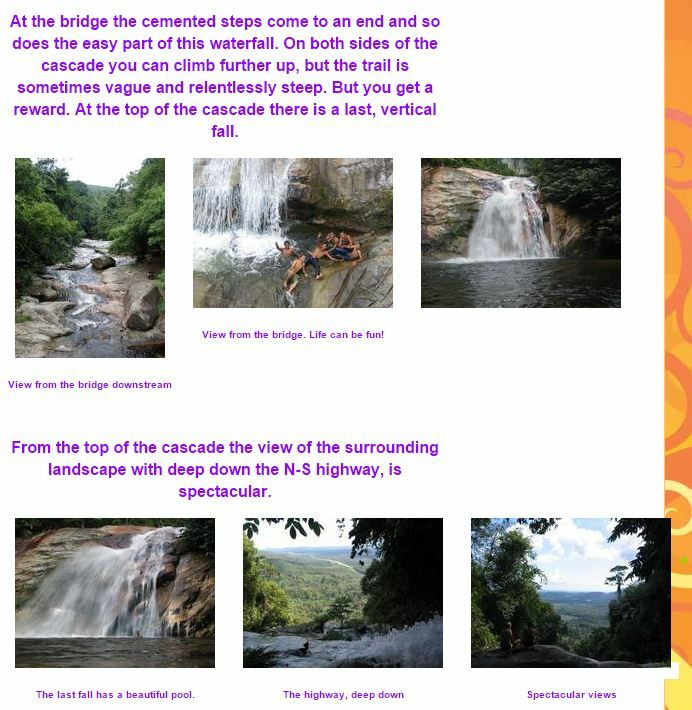 When you compare the two texts you will see that they are identical, except for one small, but telling detail: in the Big Blue article the word “five“ is omitted, and the title mentions “Top 8 Must Visit Waterfalls” . And indeed, in the Big Blue article 3 more waterfalls have been added. There are more differences. 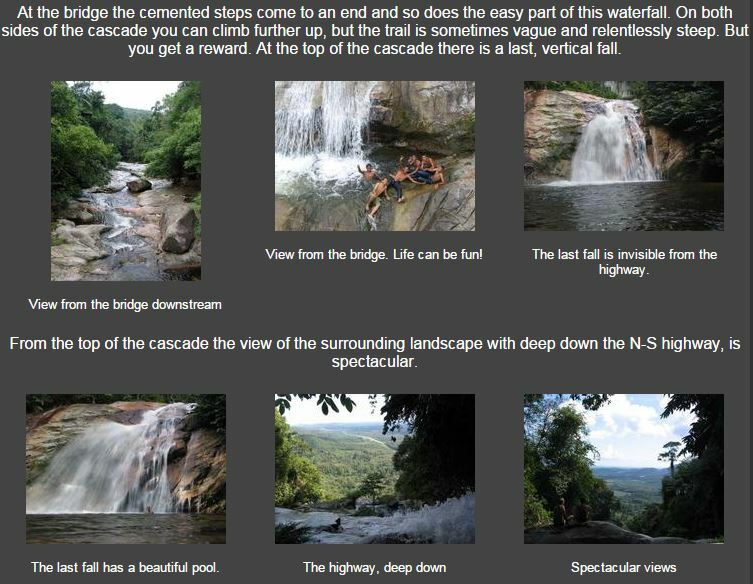 In the Big Blue article the description of the waterfalls is much more elaborate than in the original STAR article. 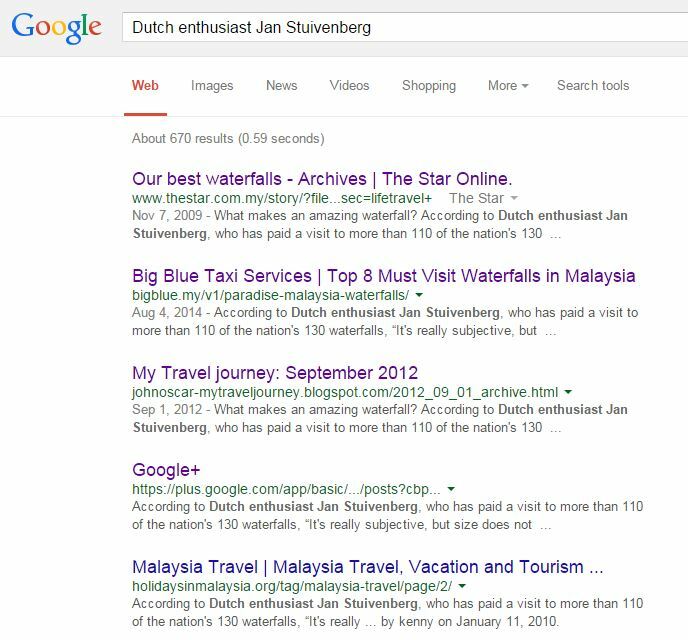 For example, about the Jerangkang Falls in Pahang. The first paragraph is identical. The rest of the text is mine! 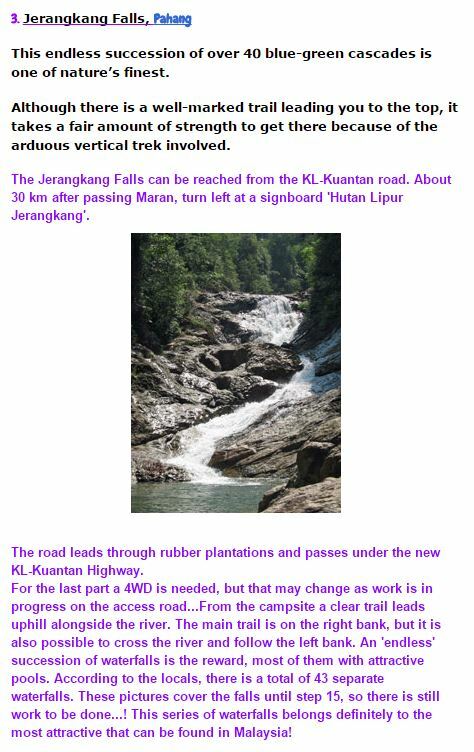 Copied from the Jerangkang page in my Waterfalls in Malaysia website. Double copycatting..:-). Ok, the pictures are different. Did Big Blue do all this? No, it is more complicated. And the Geruntum fall links to a separate page: Splashing Time At The Ulu Geruntum Waterfall , published by Kenny in July 2010. Fair enough, for this article he mentions the STAR as source. It did not take me long to find out that he had copied the content, lock, stock and barrel from Having a splashing time , written for the STAR in 2009 by my waterfall and birding friend Chan Ah Lak ! Do you still follow me…:-)? 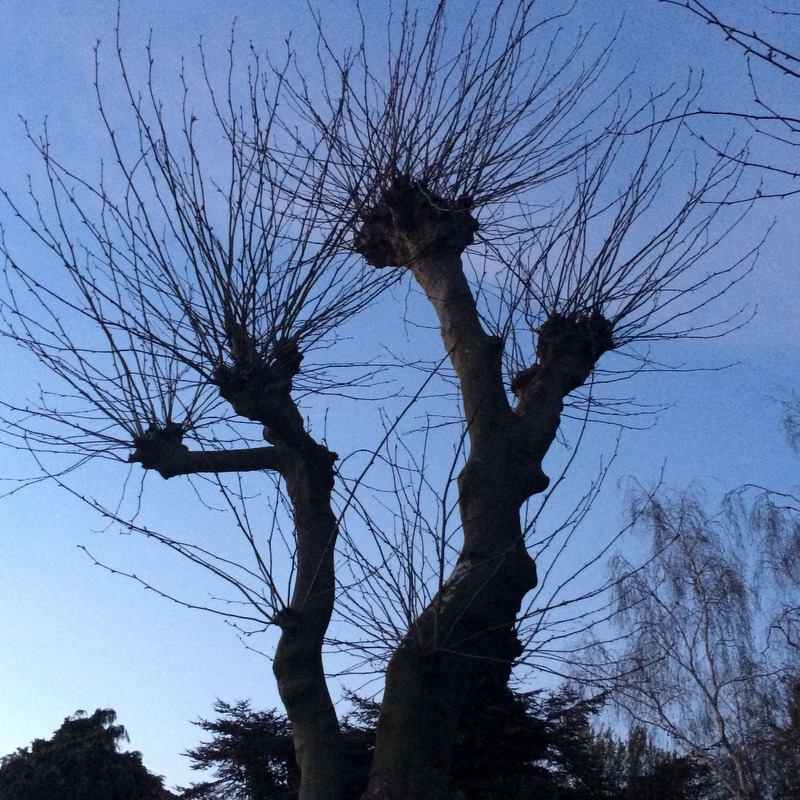 Because we are not yet there…:-). And here is the part about Jerangkang on his site. The first two paragraphs are from the STAR article, the purple part has been copied from my Waterfalls of Malaysia site. For this waterfall no pictures have been copied, which makes the sentence: “These pictures cover the falls until step 15, so there is still work to be done…!” rather meaningless. In this blog two more waterfalls are added, bringing the total to 8. 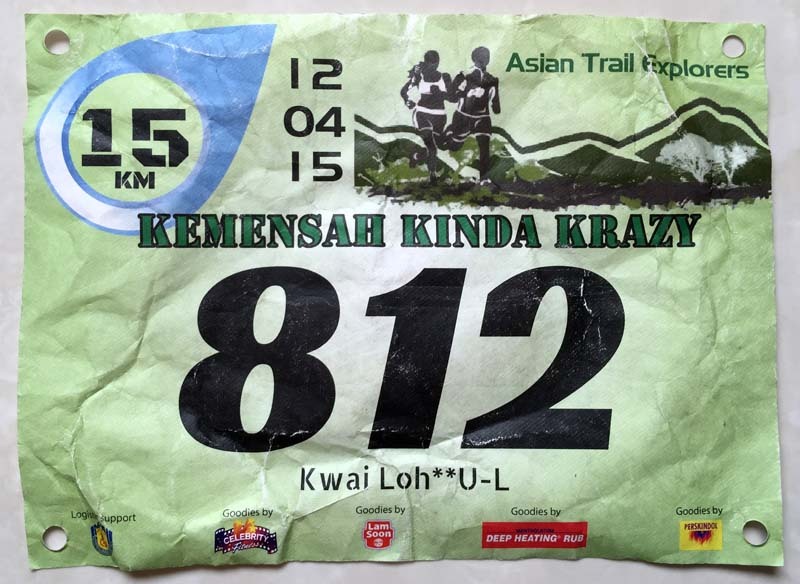 Why the Bukit Larut (Perak) fall and the Giam Klimau fall (Sarawak!) are selected from my site, is unclear to me. They are not that special. 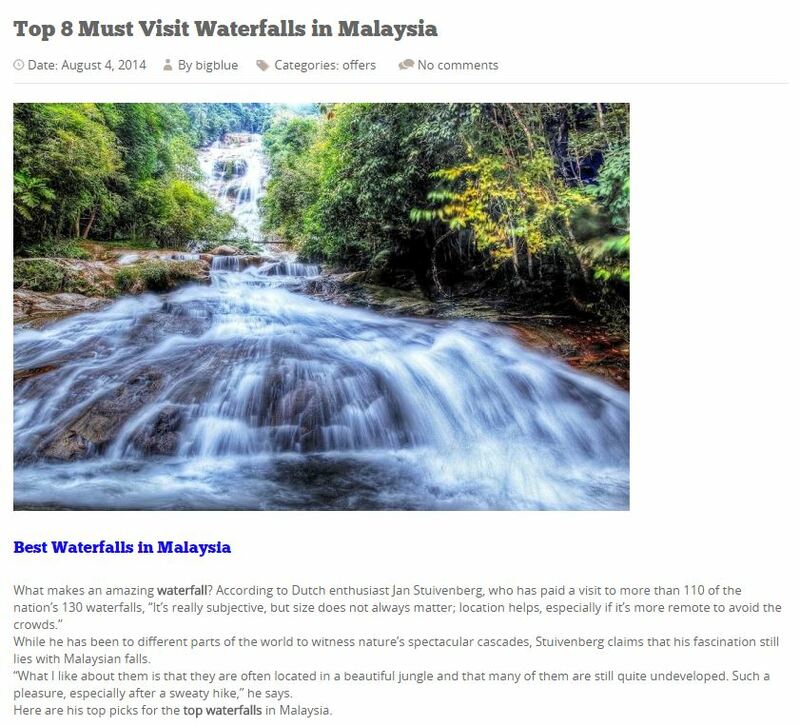 Far enough, at the end of the page, he writes: For more info can go to http://www.waterfallsofmalaysia.com/index.php………. But of course it is still copycatting. Now we are almost there, finally…:-) When I compare this My Travel Journey version with the Big Blue one, I find only minor differences. Big Blue does not link to my Waterfalls of Malaysia pictures. They have edited (and improved) the layout of the page and made some textual changes. 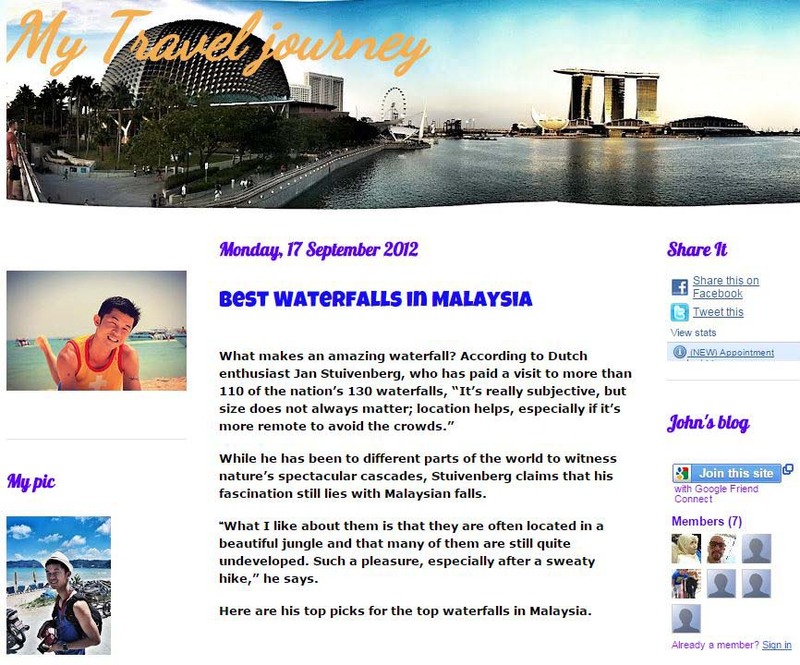 At the end they mention the Waterfalls of Malaysia site, and also that they used My Travel Journey as their source. But it still is copycatting, copycatting and copycatting…:-) My Waterfalls of Malaysia site has a contact option and the least they could have done, is to contact me and ask my permission. What utterly nonsense about “the nation’s 130 waterfalls“, LOL. 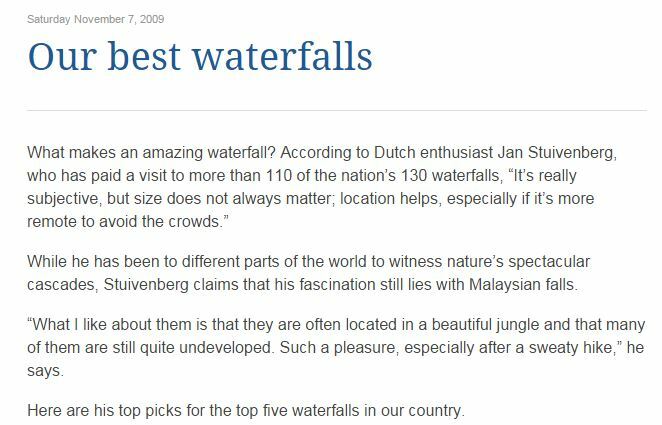 When the STAR reporter wrote her article, there were 130 waterfalls described on the Waterfalls of Malaysia site! When you visit the site now, you will see that the present count is 183. And there are hundreds, maybe even thousands more in Malaysia.